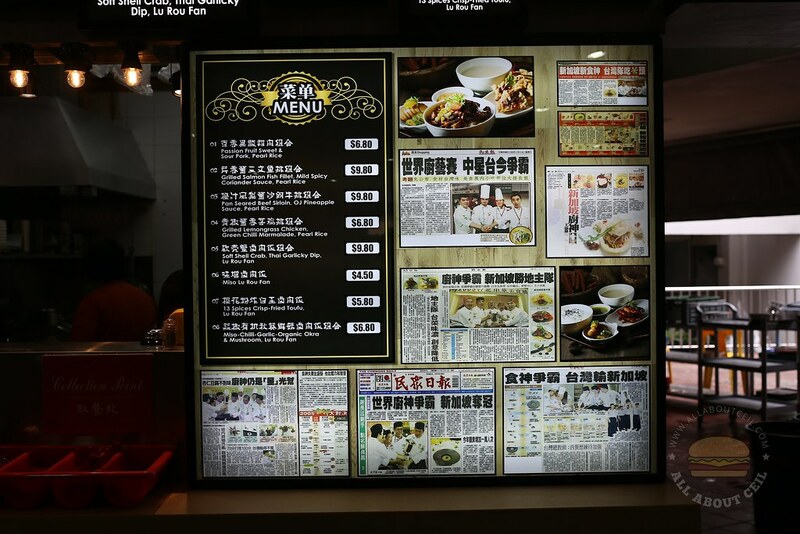 Chen Shucheng (陈澍城), 72, after launching Teochew City, his Teochew restaurant, he then partnered chef Austen Ong, 51 to start a stall in the S-11 coffee shop in Ang Mo Kio central serving contemporary Taiwanese food. Chef Ong previously worked as chef de cuisine at Grand Hyatt Singapore for 16 years before opening The Chinese Kitchen, a modern Chinese restaurant at Cavan Road in October 2017. 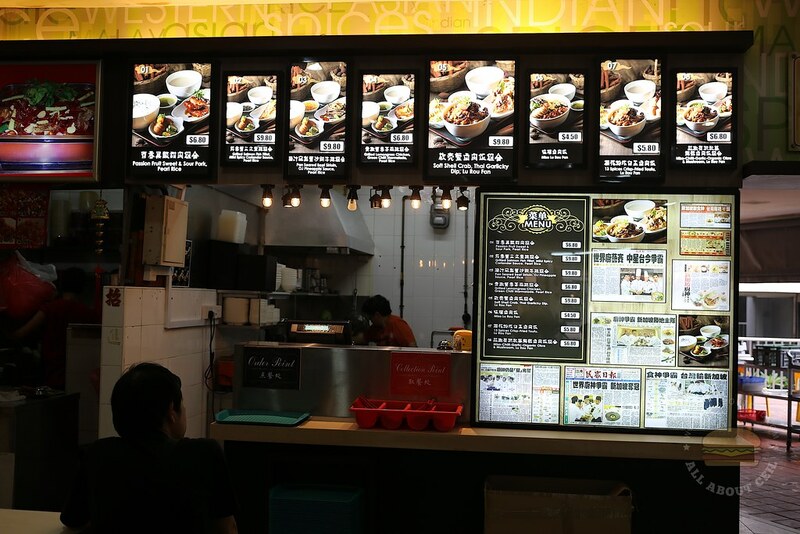 Their aim is to offer restaurant standard food at hawker prices. Chef Ong tasted a lot of recipes to come out with the menu which includes 8 set meals, priced under $10. 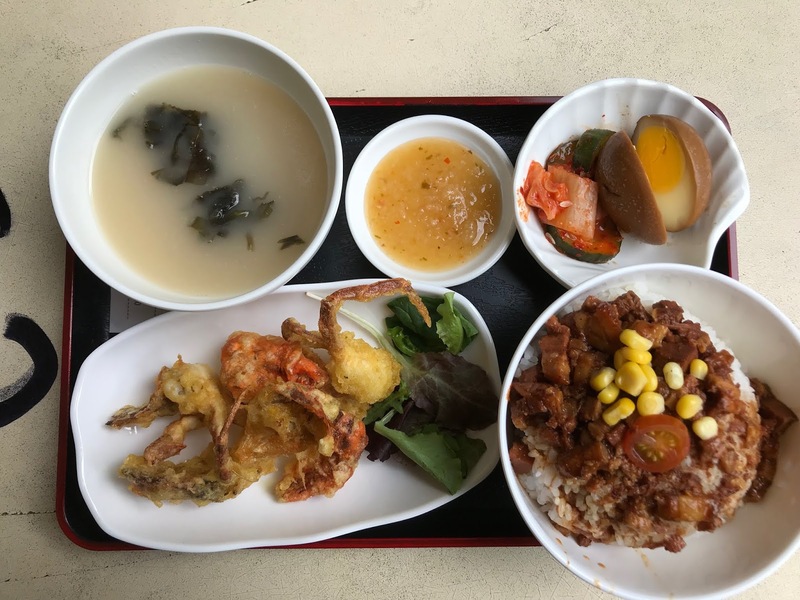 The 8 sets are Passion Fruit Sweet & Sour Pork, Pearl Rice ($6.80), Grilled Salmon Fish Fillet, Mild Spicy Coriander Sauce, Pearl Rice ($9.80), Pan-seared Beef Sirloin, Orange Juice Pineapple Sauce, Pearl Rice ($9.80), Grilled Lemongrass Chicken, Green Chilli Marmalade Pearl Rice ($6.80), Soft Shell Crab, Thai Garlicky Dip, Lu Rou Fan ($9.80), Miso Lu Rou Fan ($4.50), 13 Spices Crisp-Fried Tofu, Lu Rou Fan ($5.80) and Miso-Chilli-Garlic Organic Okra & Mushroom, Lu Rou Fan ($6.80). Chef Ong will be based at the stall for the time being while he is looking to hire and train a new chef. I ordered the Soft Shell Crab with Lu Rou Fan that served with the Thai Garlicky Dip. There is a number on the receipt and it is served according to that number. 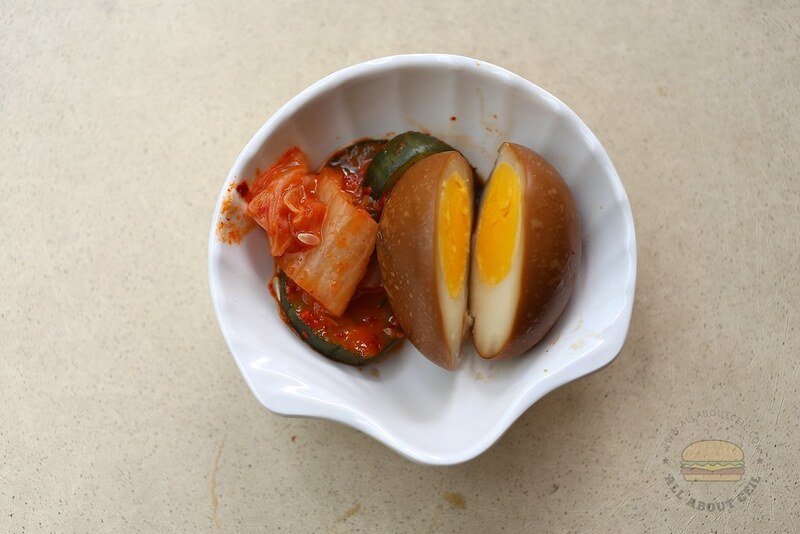 The set consists of a braised egg with a small side of kimchi and preserved cucumber as well as a bowl of soup. The braised pork is braised with Japanese red miso paste instead of the usual Chinese fermented bean sauce. 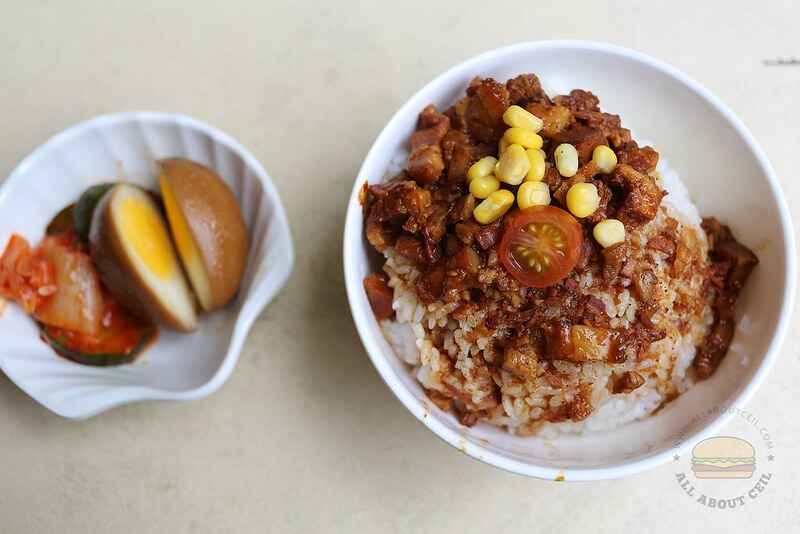 It is more savory and not as sweet as the Lu Rou Fan found in Taiwan. It would be nice if a bigger portion of braised pork is given as I left with a lot of rice after the first few mouthfuls. The short-grained pear rice was cooked to a fluffy texture. 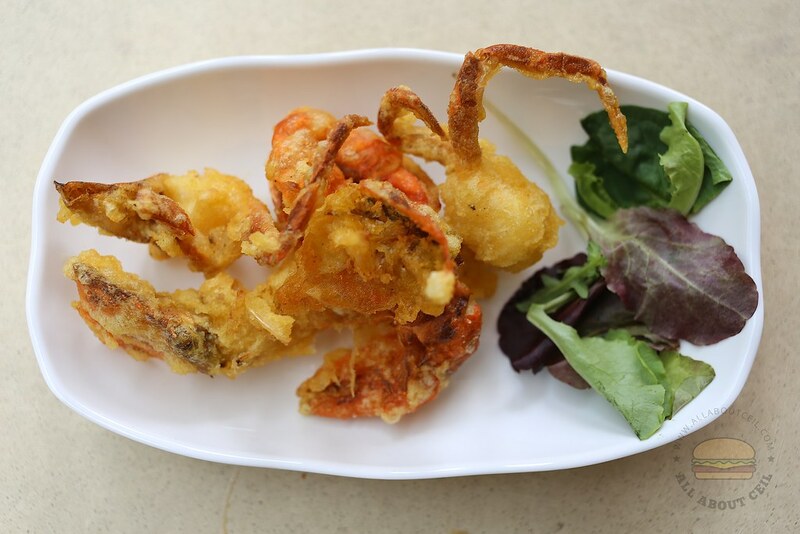 The soft shell crab was perfectly fried to the desired crispiness and it remained so till the very last bite. It is nice to eat it on its own. The Thai Garlicky Dip is not spicy, not as garlicky as it was overwhelmed by the sourness and tanginess from the plum sauce and lime juice. It did not really go well with the fried soft shell crab. The braised egg tasted quite bland, did not have much of the soya sauce and 5-spice powder that supposed to be a part of the marinade as mentioned during their interview with the 8 DAYS Magazine. I would rather have more preserved cucumber then kimchi as it seemed quite out of place and did not go too well with the set. They might want to consider replacing it with salted vegetable or even braised cabbage. 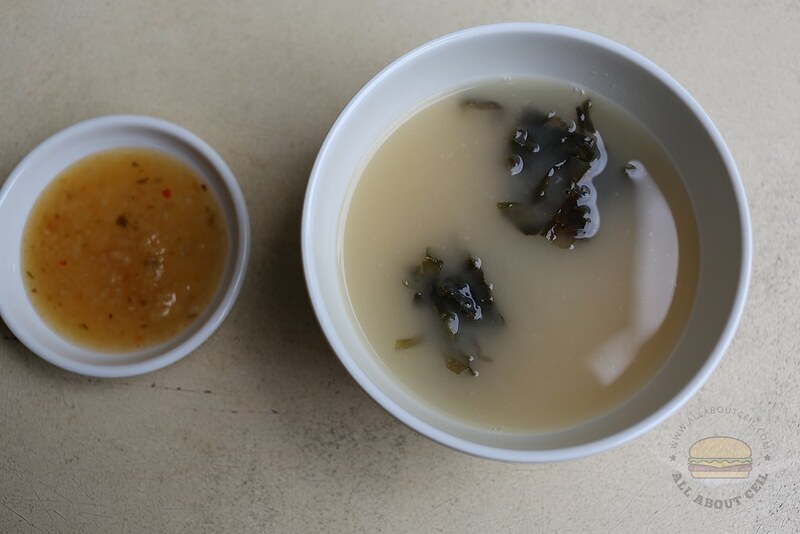 The creamy soup somewhat reminded me of the broth for ramen, there was kombu in it. Other than the Miso Lu Rou Fan at $4.50, the rest of the sets are priced on the high side and not as pocket-friendly. It might be a challenge for such a stall to actually survive in the heartland.